Ferintosh Peak is the most aesthetic peak in the Ben Ohau Range when viewed from the east. Close scrutiny reveals that Glentanner Peak is tucked behind and slightly right of Ferintosh Peak. 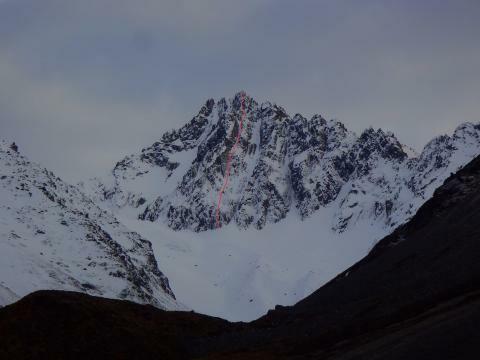 Take the North branch of Whale Stream to its northern head, scramble onto the Ben Ohau divide south of Ferintosh Peak, and traverse north to the summit. The route starts up steep ice through the lower rock band, slightly right of centre, before following a vague gully system to finish just right of the crest of the main buttress. From upper Whale stream, cross the glacier for an ascent of the East face. Fluke is a 450m grade 14 climb. Take the ramp on the left centre of the overhanging face, climb under chockstone to reach easier ground, follow central rib on good quality rock to the summit. Some level sections en route. Crux grade 14. Descent is to the south on the Dobson side of the divide, then back into upper Whale Stream. Stewart Stream provides direct access to the south side of Ferintosh and Glentanner Peaks.